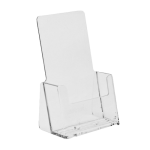 The Six Pocket Three Tier Tri-fold Brochure Holder is a customizable three tier brochure holders with three 8 ½” pockets for display on a counter top or for a wall-mounted application Using the provided pocket dividers, create a custom six pocket tri-fold holder for literature up to 4 ½” wide. 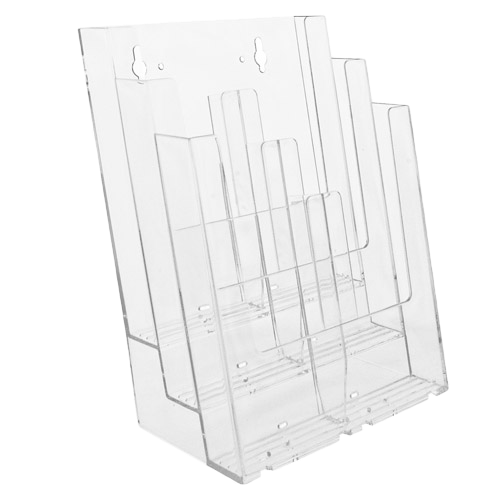 Removal of one or more of the pocket dividers allows you to customize this unit to suit your specific needs. 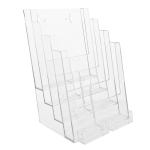 Customize this display for 8 ½” x 11” full page materials or a combination of tri-fold material up to 4 ½” side. This unit can be displayed on a counter top or wall mounted to a variety of substrates with our wide range of accessories. 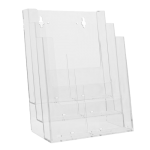 Convenience stores, post offices, pharmacies, trade shows, libraries, institutions, lobbies. Take this display to the next level by adding one or two Wall Mount Business Card Holders (WBC) to the front of this unit. Two Add A Pocket Clips (APC) are required for each Business Card Holder.